Here is free plagiarism checker software for Windows that uses Bing API. The software is called PlagiarismChecker and it can search for plagiarized text on the internet using Bing’s search API. It takes a piece of test from you and search for it to make sure that it is not copied. It shows the originality percent of the text you search via it. Also, it shows the part from the text which is plagiarized and non plagiarized. 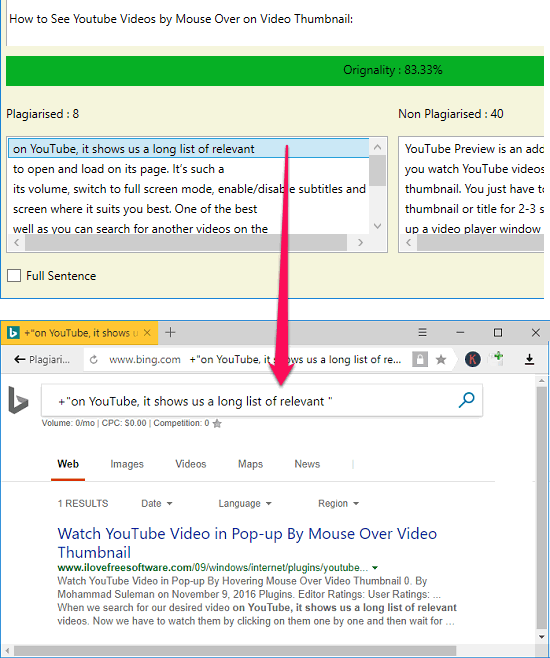 It shows you the Bing URL of the page where you can see the URL of the content where it has detected the plagiarism. However, the software has a quite a low-speed but the result that it produces are perfect. 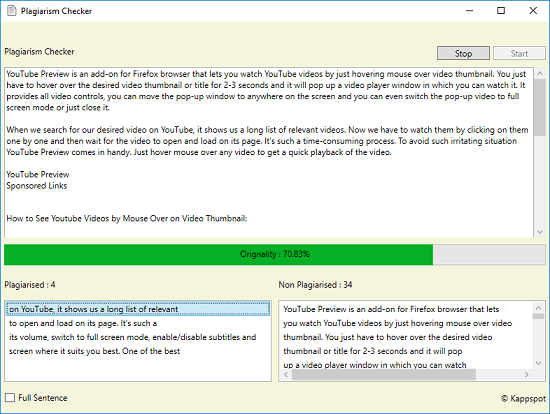 PlagiarismChecker freeware makes it very easy to check content for plagiarism. There may be situations, you have to verify a context for its originality, such as while checking papers, or other stuff. That’s where this software comes in handy. Although, there are some professional tools available, but if you want a small-scale software to check for plagiarism, then this software is very good. Just paste the text you want to verify and the software will do this job for you. Plagiarism is an important aspect after proofreading an article, so its better to take it seriously. How to use Plagiarism Checker Software to Check Plagiarism using Bing API? 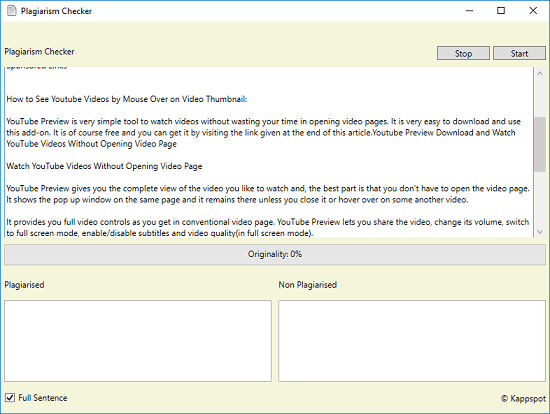 PlagiarismChecker comes as a portable software and you can run it from a USB flash drive. And an active internet connection is all it needs to do its work. This software can actually work in two different modes. In the first mode which is the default one, it checks for plagiarism by searching the content sentence wise. In the second mode it breaks the text you have specified into fragments and then tries to find the math of the content. On the interface of the software, you can see a progress bar, indicating the progress and originality of the text. Also, after it has finished checking, you can see the content which has plagiarism and plagiarism free text separately. Here are a few steps to use Plagiarism Checker Software to Check Plagiarism using Bing API. Step 1: Launch the software using its EXE that you can download using the URL at the end. After its interface has popped up, you can paste your text in the upper section. Step 2: Hit the start button and it will start searching the context for plagiarism. You can see the progress bar of the software to analyze how the software is working to verify your context for originality. 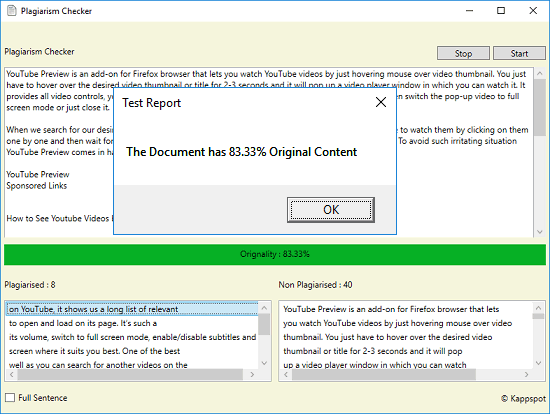 Step 3: After it has done checking your content, you can see the result and it shows you a dialog box indicating the originality percent of the content. The content that it marks plagiarized is at the bottom right position. You can click on any line and it will open the page in default browser and you will see the search result entry which has conflicted with your content. This is all it takes to use this plagiarism checker software for Windows. It does what it says. However, I would like to suggest you not to use this software for heavy work. This software is suitable for low scale plagiarism checking like papers and small articles. PlagiarismChecker is a very good software for checking plagiarism using Bing search. However, I will again like to remind you that this software is not suitable for regular checking. So, if you need a plagiarism software on your PC, then this one will be a good pick.